The Convenience Pack provides the ultimate in convenience. With 12 rolling shelves your EuroCave will have top-to-bottom rolling shelf convenience. Installation of each shelf requires two included brackets, no tools required. 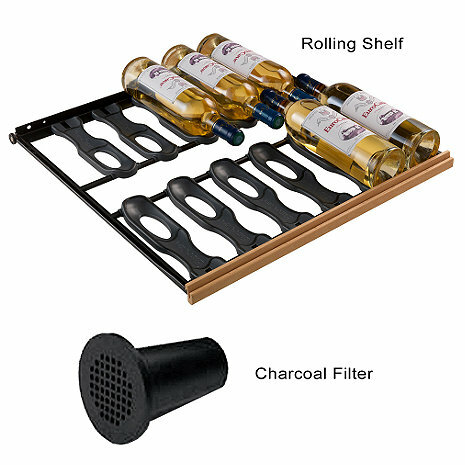 Each rolling shelf holds 12 bottles of wine. The 2 replacement universal charcoal filters provide 2 additional years, since they need to be replaced once a year. The Convenience Pack provides the ultimate in convenience. With 12 rolling shelves* your EuroCave will have top to bottom rolling shelf convenience. Installation of each shelf requires two included brackets, no tools required. Each rolling shelf holds 12 bottles** of wine. The 2 replacement universal charcoal filters provide 2 additional years, since they need to be replaced once a year. *This package is for the EuroCave Performance (excluding Built-In), Comfort, Digital Comfort, Elite and Premier series.